The barred owl is the only owl species in Minnesota that has dark eyes. When youngsters are still growing, their eyes appear bluish in color and people often confuse this normal color with cataracts. These kids can see just fine but are pretty stoic and may not respond to stimuli as we expect they should. For the next couple of weeks, young barred owls will continue to venture out of their nest cavities to investigate the world. Like most raptor species, these owlets are out and about before they can fly well and sometimes end up in precarious places. If they appear uninjured and are in a safe location (not in the middle of a road for example) they should be left alone and mom or dad will feed them at night. If they are not in a safe location, they can be gently moved and placed on a branch as close to the recovery location as possible. 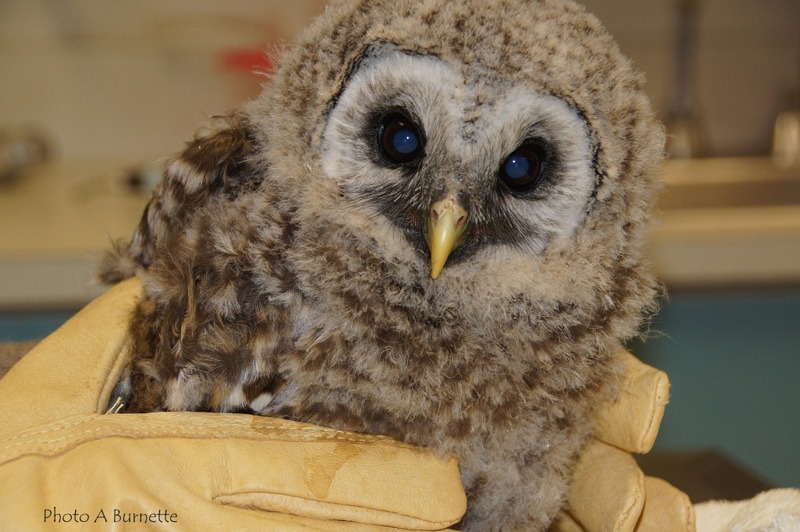 If you find a juvenile barred owl on the ground or perched on an unusual structure, DO NOT REMOVE IT. Please contact TRC (phone 612-624-4745 or email raptor@umn.edu) for guidance. Humans cannot raise raptor babies as effectively as can their own parents. The majority of the time the adults are close by, raising their youngsters in a fashion typical of the species, even if we don’t immediately see them. The main bond between these mobile youngsters and their parents is food. When the youngsters are hungry they call for their parents to come and bring them dinner until they figure out how to hunt by themselves. When caring people try to feed these youngsters that critical survival bond is broken. The rearing behaviors of raptors do differ by species, so as the baby season continues and youngsters from other owl and hawk species appear, please DO NOT REMOVE THEM from near their family. Please contact TRC to determine if intervention is really necessary. We all want to do the right thing by our feathered friends. TRC can help with advice on each instance to make sure that these raptor families stay healthy and together.